As one of the original building materials used by man, timber has come a long way. Over the last 15 years, R&D in Europe has seen the development of solid cross laminated timber (CLT) panels and the relatively quick adoption and integration into standard builds in both the private and commercial sectors. CLT is now also being imported to the Australian market from overseas developers. How we go about integrating this product into our building and construction industry will require a re-think on the way we design and plan our builds. CLT is a product that, from European experience, shows promise in providing our industry with many new advantages over the use of traditional building materials. 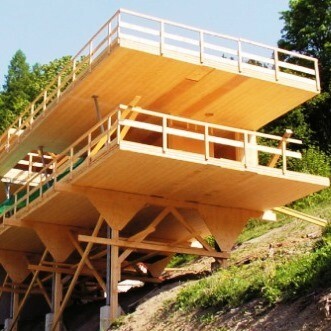 Due to the ability to manufacture large scale CLT panels, (up to 3m wide and 16.5m long), engineers now have a new tool in their belt to overcome the limitations normally encountered when using single timber elements. By using high quality connection techniques together with well-produced CLT panels, designers and their structural engineers now have more freedom in their structural design approach. Apart from these technical advantages in structural design, CLT panels can be produced very economically in a factory environment. In turn this also means wall and floor panels can be produced to a high degree of detailed prefabrication. This not only keeps the costs of materials down but also shortens the build time required. Transportation from Europe to Australia will of course impact design opportunities as container space limits the maximum size of panels; therefore transport costs must also be considered. Flat plates: Used as suspended ceilings supporting gravity loads. The main direction of impact is perpendicular to the middle layer of the element. Flat plates used as sheets/disks: The main direction of impact is in line with the middle layer. Combined structures: Building 3 dimensional structures using CLT in different directions forming rooms /boxes. In terms of application, CLT can be used in a vast array of circumstances. Today’s modern architecture often calls for large open planning, oversized window openings, point supported ceilings and cantilevered structures. In all instances, CLT can fulfil the structural requirements for these designs. Inspiration and reinforcement of CLT’s capabilities can be seen in the many and varied projects already documented and constructed from around the world. Pictures provided by KLH, one of Austria’s leading CLT producers. The production methods used for CLT provide enormous advantages. Typically kiln dried, finger jointed spruce planks are sorted and then cut into sheets. These sheets are then stacked at right angles and glued under a high pressure bonding system in perpendicular layers. The selection of timber combined with the gluing and pressing process is highly automated, which produces a high quality and consistent product. Of interest for Structural Engineers is the limitation of standards. National standards for CLT are only available in German speaking countries, being Germany, Austria and Switzerland. In order to accommodate CLT, Eurocode 5 (Timberstructures) will need reworking to provide standardised guidance on design and use of the product. Historically the biggest drawback with any timber structure is fire. Many countries with highly populated areas have seen devastating fires (London and Vienna, for example) and the building codes in Europe reflected this issue by preventing multi-storey construction using timber and timber products as the main structural material. It should therefore not come as a surprise that the world's tallest CLT apartment was built outside of Europe and in Melbourne, Docklands. This was the Forte Building by Lend Lease and the CLT building structure was produced by KLH (their CLT is now distributed by Tilling in Australia). For those designing structures using CLT, the effects of fire must be considered. When exposed to fire, timber’s composition undergoes changes. The burning causes a chemical process which produces gas and charcoal – the later forming a protective coating over the remaining timber thereby extending the fire resistance. EN 1995-1-2 only covers timber cladding, plywood and timber materials, not CLT. In general for unprotected timber elements a constant burning rate can be assumed. CLT elements however behave differently under fire conditions. Due to the manufacturing process using single timber layers and glue, the burning rate might even be increased. To assess the fire resistance of any proposed CLT structure, a structural engineering design must first be calculated using engineering principles based on the research carried out by the Technical University in Graz, Karlsruhe and other European Institutions. In accordance with code requirements modern timber structures need to perform under ultimate (ULS) and service conditions (SLS). Under service conditions deflections and vibrations need to be assessed separately. In general CLT structures, due to their increased mass, increased cross stiffness and dampening effect are very effective for use in building applications. World-wide, the methods used when constructing suspended floors vary greatly. We see significant differences in floor cross sections depending on which materials are used and how they are combined. Currently the use of screeding is highly recommended when using CLT as the substrate by several research institutions to prevent noise and vibration issues. Additionally, the support conditions of floor systems, which have a large influence on the overall performance of the finished floor, need to be accounted for in the design process. In summary, for Australia, CLT is a great new product for the building and construction industry to consider due to its excellent environmental credentials, the increased design freedom, the economical savings gained due to reduced handling and site time, and not to mention the added benefits of living in a solid structure made from natural timber. Its use does require a new way of thinking about the building process. Using CLT requires proper planning, detailing and advanced structural design ability. More time must be spent in the technical offices than on site in order to fully document the project. The very common way of designing in Australia while already in construction cannot be adopted for this product. Building tolerances on site need to be adjusted to fit in with the tight tolerances used to produce the CLT panels. Document control by all involved parties, as for every prefabrication process, is crucial for successful project delivery. Written by Bernhard Waschl CPEng, MSc (Structural & Geotechnical), BEng (mechanical) GCE Structural Engineers.Waschl holds a Masters in Structural and Geotechnical Engineering and a Bachelor Degree in Mechanical engineering. Educated at the Technical University Vienna, Austria, he has been working and designing CLT structures since the early introduction of this building material in Europe. For further information and advice on the use and design of CLT structure email [email protected].